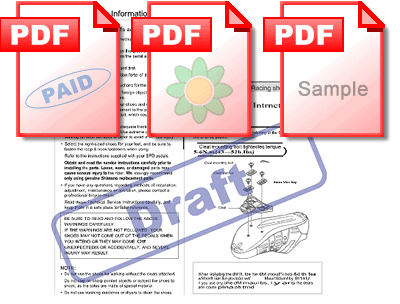 Solid PDF Tools v6, Solid Converter PDF v6 and Solid PDF Creator Plus v6 each come with a set of pre-defined watermarks that can be modified to meet your needs. If you don't see a watermark that meets your needs you can create and use your own. All three products allow you to easily create your own custom text stamps (text watermarks), or add image files or PDF images that can be modified and saved for future use. To edit an existing watermark simply select it from the Watermark Palette and click the "Edit" button. Your selected watermark will appear in the "Edit Watermark" dialog where you can make the required changes. Applying your watermarks is as simple as drag and drop. Simply select the desired mark and drag it from the palette to your PDF document. 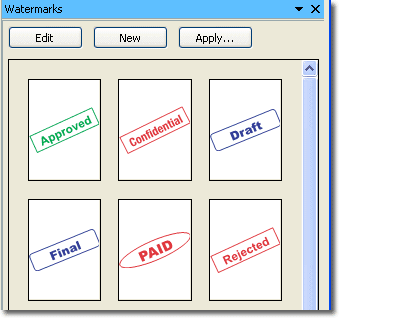 This method will apply the watermark to every page of the document. You can also apply watermarks to a select page or a range of pages via the Pages Pane using right-click functionality.